Mark & model: Features of soap vacuum dryer: Liquid soap base would be dried to solid immediately; production efficiency high; fatty acid of produced soap noodle adjustable; easy to calculate and control production consumption; operate easy; production environment and end soap noodle clean. 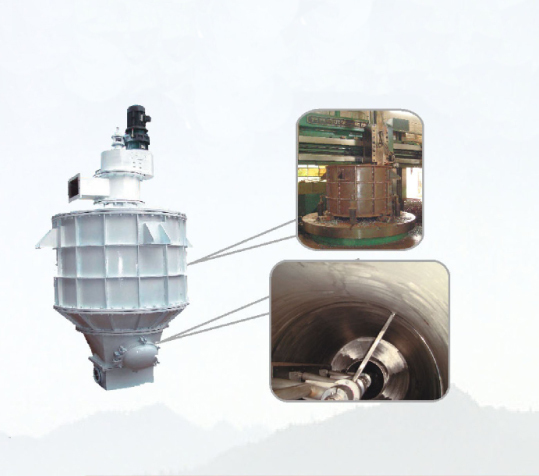 The vacuum spray dryer is used to dry the soap materials from liquid to solid rapidly and evenly. The whole vacuum drying system can control the fatty acid content of soap noodles and soaps. Adopt hard tooth surface gear reducer and the oil pump inside lubricates automatically and makes a long lifespan. The thickness of barrel is 14 mm, the inner wall is processed by vertical lathe to achieve the coaxiality and smooth surface. The shaft is made by a ?108 x 14 mm seamless tube. The nozzle (?10 mm) in the shaft sprays liquid soap, the three blades scrape them down, and the soap materials dry out fast and even. The whole set of vacuum drying system can make soaps with fatty acid content from 55% to 80%.